Invisible fencing is becoming more and more popular these days but there are some unique considerations a German Shepherd owner needs to make before they invest in one for their own yard. In this article, you’ll learn about invisible fences for dogs, the challenges of using one with a German Shepherd, and some special tips for training your German Shepherd properly so that the invisible fence is effective. An invisible fence is basically a wire that you bury underground around the perimeter of your home. It is electric and connects to a transmitter which sends signals to a receiver placed on your dog’s collar. When your dog reaches the boundary (where the wire is buried), the transmitter will trigger the dog’s collar to give a small, electric shock. You can usually regulate how weak or strong this shock is but at any level, it’s safe enough that it won’t harm their health or cause great pain. It just causes enough discomfort to motivate your dog to avoid crossing that boundary. Typically, you put up very small flags (at least during the training period) so that your dog knows the boundary that they should stay within to avoid the shock. There are many invisible fence kits on the market. 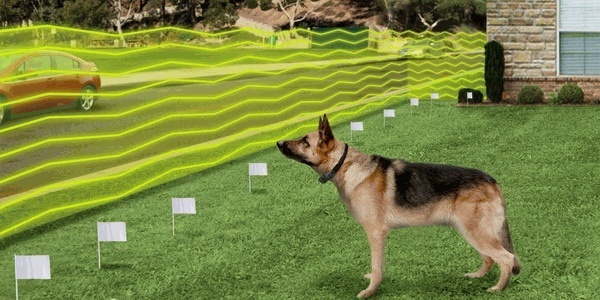 Most electric dog fence systems aren't actually invisible. They require you to bury up to 2,000 feet of wire around your yard, digging trenches, and then covering them up -- while hoping that the grass doesn’t die above the wire. The PetSafe Wireless ﻿Dog Fence changes the game completely. There are no wires that you have to bury, and the fence is easily detected by your dogs to ensure they always know where the boundary is located. 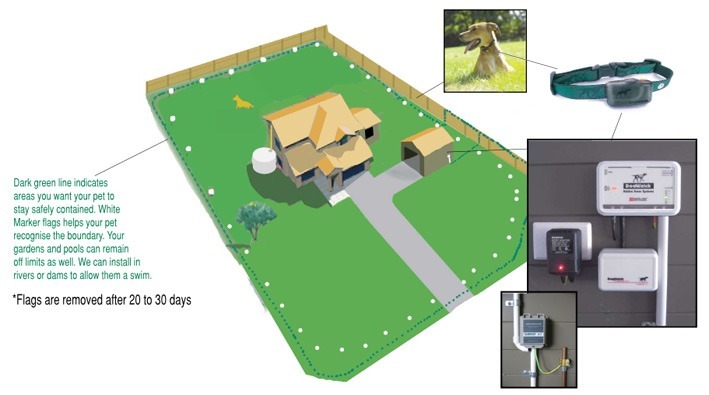 Creates An Instant Boundary Around Your Yard: To install the PetSafe Pet Electronic dog fence, all you have to do is install the receiver in a central location in your home, and then place the flags within 90 feet of the receiver to create the boundary. There are no wires to bury. Adjustable From 5ft To 90ft: You can instantly adjust the perimeter to create a safe zone of anywhere from 5 feet all the way up to 90 feet from the receiver’s location. By moving the flags, you control the boundary. Easy To Install: Within a matter of hours, you can install the system, and get help from tech support if you find yourself having problems during the installation process. Simply plug in the transmitter, set the flags, and attach the collar. Waterproof Collar: A lot of invisible fence systems include collars that are not waterproof, which means they’re quick to malfunction if they get wet. The last thing you want is a malfunctioning collar that could potentially shock your dog when they’re nowhere near the boundary. 5 Levels Of Correction: Whether you’re attaching the collar to a small 20-pound puppy, or a 70-pound adult, you can adjust the level of correction to suit. If you notice your dog is a bit stubborn and tends to ignore the correction, turn the level up a bit to get their attention again. Operating Range May Be Impeded: If you install the device near other electronic components you may find out that you have issues trying to run proper testing, and when you are trying to set the boundary during your initial installation. Tech support recommends that you keep the sending unit at least 5 feet away from other electronic components. May Interfere With Wireless Security System: Some customers have reported that their wireless security system would interfere with the boundary, causing inconsistent testing, and sometimes failure to properly operate. If you have a wireless security system in your home, verify the frequency range it uses, and then compare to the wireless containment system. While a bit pricey, the best invisible dog fence you can buy is PetSafe Wireless Dog Fence. It is perfect if you want to keep your GSD in the yard, without having to dig your yard up in the process. There is no dealing with wiring that can become tattered or frayed, requiring constant maintenance. It’s easy to install and works perfectly for keeping your dog in the boundary you’ve set for them. If you follow the instructions and get on the phone with tech support when you need them, your system will be up and running in a few short hours. To learn more about the PetSafe Wireless Invisible Dog Fence, and read reviews from other customers, click on the button below. That is everything you need to set up an invisible fence in your backyard. And it’s enough footage to securely cover as much as 4 acres of land so you can give your pooch a lot of space to run around happily. With that in mind, this may not be the right kit for everyone. 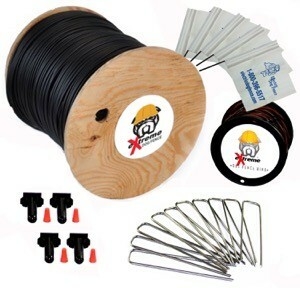 With 2000 feet of wire, someone with a small backyard will have much more than they need so you might look into a smaller kit to save money and clutter. On the other hand, for those with more than 4 acres, you can easily (and affordably) buy 2 or more of these kits to use in combination so that you cover the full acreage that you need.In short, this is a great product that offers all the benefits you can hope to get from an invisible fence. It’s easy to install, affordable, and allows you to keep an open landscape without risking losing your dog. Easy and affordable: it requires fewer materials than a standard fence and you can install it yourself easily. This saves you money on both materials and professional installation. Landscaping: a nice open yard looks much better than one that’s been walled off with tall, intrusive fencing. You can keep your dog safe and your yard looking beautiful and open. There are a few challenges to using an invisible fence with a German Shepherd. While they can be overcome with the right training and dedication, they are worth considering because you may not have the time (or the desire) to invest the time and patience needed to overcome these challenges. Training: with any dog, you will have to first take the time to train them with the invisible fence. They need to make the association between the electric shock and the boundary so they know how they are supposed to behave. This takes time and patience. And if you skip it, your invisible fence will be a waste of money. Electric shock: this can be an issue for 2 reasons. While they are designed not to injure the dog, it is meant to be uncomfortable. Some owners might not be ok with causing any kind of discomfort to their dog. So if that’s not something you want to do, don’t get this fence. Secondly, German Shepherds are big dogs and more tolerant to pain/discomfort. The shock intensity on many fences may not be enough to act as a deterrent like it should. Backfiring: if you’ve got a stubborn pup, it might choose to endure the shock to break past the boundary anyway and once it’s past the boundary, it’s not going to want to come back in and endure the shock again. So you really have to make sure your dog is well-trained and able to control their urges when they see, say, another dog or a squirrel they want to chase outside of the boundary. Introduce the dog to the boundary. Walk them around the perimeter (which should be marked with the flags). Go close enough to trigger the beeping (most fences trigger a warning beep before the shock) and then lead your dog away from the boundary. This will start the association that beeping means it’s time to turn back. Show the correction. While on a leash walk with your dog toward the boundary. Let it cross the boundary and trigger the shock and then lead your dog away from this fence. This will show them that if they ignore the beeping and continue, they will get shocked. Repeat. Continue walking along the perimeter while your dog is leashed so that they can become used to the new situation and the boundary. Off leash testing. When you start to notice that they respond to the beeping by turning back or moving away from the boundary, you can try testing them without the leash. Do this gradually by taking them off leash for just a few minutes to see how they do and then leashing them again until you are sure they fully trained to stay inside the boundary. No unsupervised play. During training, even when they are safely playing off leash, do not let them play outside without supervision. You need to make sure the training sticks. If they break through the boundary, you’ll want to be able to catch them as soon as you can. Avoid walks. While training, it is best if the dog never leaves the boundary at any point. So that means no going out on walks until the training is done. This can be a challenge for an energetic Great Shepherd so make sure they get plenty of outdoor play time inside the perimeter while they’re training. Eventually, you will be able to remove the flags if you like but allow at least 3 months of off leash playing inside the boundary before you start removing flags. And to play it safe, you can start by just removing a few flags each week until they are all gone. So, after 3 months, remove every second flag. Then a week later, again remove every second flag. Continue until they are gone. For German Shepherd owners, you may want to consider leaving these flags in so that your dog always has a visual reminder to prevent them from giving into their curiosity and urge to leave the boundary. 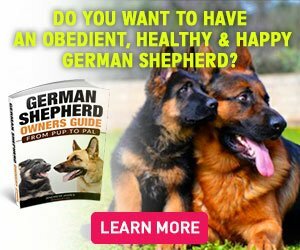 From this article, you can see that there are a lot of great advantages to using a wireless invisible fence but using it with a German Shepherd can pose some unique challenges and there are simply some individual dogs that just aren’t going to be easy to control with an invisible fence. So before you make your final decision, make sure you take the time to really know whether or not it’s a practical option for your dog. And if you decide that it is, use the tips and info in this article to make sure you get the most out of your invisible (electronic) fence.